U.S. Republican presidential candidate Donald Trump speaks at the Family Leadership Summit in Ames, Iowa, United States, July 18, 2015. U.S. Senator John McCain, a decorated military veteran and former prisoner of war, has called on Republican presidential candidate Donald Trump to apologize for belittling the wartime suffering of captive U.S. troops. McCain, who spent more than five years as a POW during the Vietnam War, spoke on U.S. television Monday during a campaign appearance, two days after Trump publicly mocked his military record. Trump said of the former captive: "he's not a war hero. He is a war hero [only] because he was captured. I like people who weren't captured." FILE - Sen. John McCain talks to the media on Capitol in Washington June 18, 2015. 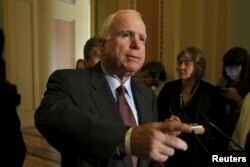 McCain told MSNBC television Monday that he is not seeking a personal apology. But he suggested that billionaire Trump publicly tell American veterans and their families that he is sorry. "I think he may owe an apology to the families of those who have sacrificed in conflict and those who have undergone the prison experience in serving their country," McCain said. "... To denigrate that service, I think, is offensive to most veterans." For his part, Trump has shown little public remorse. He said Monday his comments were taken out of context by his political rivals, as he sought to reframe his controversial remarks. Speaking by phone Monday to NBC, he acknowledged McCain's bravery. "But we don't talk about people who weren't captured, and that's what I was trying to refer to." Trump's comments in the state of Iowa Saturday triggered a firestorm of criticism among some high-profile veterans and the nine other Republican candidates seeking their party's presidential nomination. U.S. Secretary of State John Kerry, a Democrat who also served in Vietnam, described McCain Sunday as "a hero, a man of grit and guts and character ... who endured unspeakable acts of torture" during his confinement. Leading Republican presidential contender Jeb Bush also condemned Trump's remarks, saying "enough is enough with the slanderous attacks." Other Republicans called for Trump's withdrawal from the campaign, saying he is unfit to be president. Democrat frontrunner Hillary Clinton also criticized Trump. But she also accused Republican hopefuls of being slow to repudiate Trump for other controversial remarks about Mexican migrants. Trump recently called some such migrants "rapists" and said some of them are bringing drugs and other criminal activity to U.S. soil.